Summer is perfect for the newest foodie ideal currently returning to our culture of health – that we take ownership over our own health through foods grown close to home. This “farm to table” concept already has a media presence: US News and World Report reported the number one consumer trend to be vegetable gardening, and the mantra to “eat local” is even finding its way into conventional grocery stores. A perfect everyday example for our own personal farm to table experience is to grow our own gazpacho. In case you don’t know, gazpacho is a cool summer soup, which is basically a delicious liquid salad of Andalusian (Spanish) origins. The ancient version of this soup included only stale bread, garlic, olive oil, and vinegar (the tomato base came later … about 400 years ago), and served as an everyday poor man’s food made of common garden staples and leftover bread. Today though, gazpacho still includes bread and garlic, olive oil and vinegar, but a garden of gracious flavors have since been added: tomatoes, cucumbers, and bell peppers at the very least. Obviously, the best gazpacho on planet Earth will come from the vegetables we grow with our own hands, in our own earth, in our own gardens. Getting the ingredients: Finding good quality vegetable plants is just like finding good quality vegetables themselves. You can get them from large retail outlets that have gardening sections, but the best quality will be found at your local farmers’ markets. Big retail locations, like conventional grocery stores, purchase in the massive quantities that basically “dumbs down” the quality to the lowest common denominator. They’re not bad, but certainly not the best. A better source of vegetable plants comes from the farmers themselves. The advantage of purchasing your plants directly from them is that you can get the heirloom varieties that have not been bred and cross-bred and cross-cross-bred, just to produce some uniform trait and homogenized flavor. That’s how to get a tomato that has not yet been turned into a widget. Few items are easier to grow than the basic three vegetables in gazpacho – tomatoes, bell peppers, and cucumbers – with just a couple of pointers to remember. Planting Your Gazpacho:All of these vegetables grow wonderfully in porch pots or in an outdoor bed, and each requires the same basic conditions: plenty of sun along with well drained, moist earth beneath them. When you’re ready to plant your ingredients, first turn some organic compost (found in any garden section) and mulch (such as wood chips or bark) into the soil. Then set the plants about two feet apart from each other. Growing Your Gazpacho:Tomatoes need to be tied to a stake or set inside a wire cage to keep the heavy fruit from pulling its limbs to the ground. Cucumbers are vines and will run either along the ground or up a trellis (if you need to conserve space). Peppers are small bushes, and so can stand alone. But all of these succulent plants love their sun and love their water, so make sure the soil stays moist, by just giving them a drink each day. Harvest your fruit as it ripens, and set on the kitchen counter. It’s really that easy. Preparing Your Gazpacho:This amazing soup is as easy to throw together as it is delicious to eat. From your gazpacho garden, you’ll need 4 large ripe tomatoes, 1 red bell pepper, and 2 cucumbers. Then, to spice it up, you’ll also need 1 clove of garlic (minced), about 2 Tbsp each of minced basil and rosemary, 3 Tbsp lime juice, some Tobasco, salt and pepper to taste. First, score the skins of the tomatoes and put them in a pot of boiling water for about 15 seconds or so. Pull them out, slide the skins off, cut into quarters to remove the seeds, and then coarsely chop. You’ll also chop the bell pepper and peeled cucumber. Soak 2-3 slices of stale bread in water for a couple of minutes, and then squeeze out the excess. Put the bread and chopped vegetables in a food processor with 2 cloves of chopped garlic and 2 tablespoons of red wine vinegar. If you like your gazpacho with more body, keep out a handful of the veggies, mince them, and add back to the soup at the end. Otherwise, puree the entre mixture until smooth. Leave the machine running and slowly add 2 cups of tomato juice along with 1 ½ cups of organic stock (organic vegetable, chicken, or beef), and ½ cup of olive oil. Salt and pepper to taste, and refrigerate for a couple of hours or overnight. The flavors will marry and improve over time, so taste for the salt, pepper, and vinegar after a while. You can thin this soup, if you like it more brothy, with stock. Eating the gazpacho: At the end of a hot summer day, you’ll welcome the crisp coolness of this refreshing meal, especially when you’re eating it outside. Plus, you made this delicious dinner for yourself without ever turning on the stove! To make your gazpacho a complete meal, head out to your porch and start with a little ripened melon, rolled prosciutto, a few olives, and a crisp white wine of your choosing. The gazpacho itself can then be served, garnished with a drizzle of your best olive oil, or even sour cream, to your tastes. Be sure to sample the aroma as you taste, and include a lighter red wine with this course. You want this portion of the meal last as long as possible, so don’t rush through it. Finish with a few slices of well aged cheddar and dried cherries to cap the perfect end to the perfect summer meal. Take enough time with your gracious gazpacho evening to recognize what you’ve accomplished by putting nutritious food on your table, with your own hands. Now relax, exhale, and let yourself enjoy the ebbing day. Get this. The calories that kids eat away from home has increased from 23.4 percent to 33.9 percent between 1977 and 2006. Those take-out foods are high in sugar and salt and synthetics and, oh yeah, calories. We used to cook more at home. We used to eat together as a family at home. We used to not be so fat and unhealthy all the time. In fact, eating out increases the volume consumed, the salt consumed, the sugars consumed. Here are the study data (pubbed in the Journal of the American Dietetic Association). 29,217 U.S. children aged 2 to 18 took part in surveys of food intake, between 1977 and 2006. 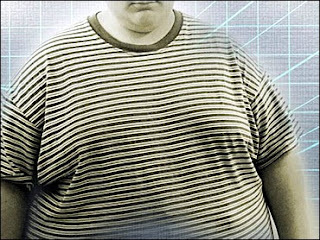 The researchers found that the number of calories children got from foods eaten away from home increased significantly. In fact, the percentage of calories children got from fast food was greater than those they got at school. I don’t know — and I know I will get some people to defend their inability to make food for their families … or even defend their inability to purchase decent foods — but it seems like there is a choice being made. The choice to make your food at home; the choice to make family time a commitment. “We cannot control where these eateries are located or how they prepare their foods, but we can decide to cook more at home, which will ultimately save money and help keep our families healthy,” Heller said. It’s too expensive …. Although it appears a take-out meal for $4.99 is a great deal, one would actually save money by going to the store buying chicken breasts, vegetables, whole grain pasta, bread and sauce. “You would have a healthy dinner and leftovers for tomorrow’s lunch and probably enough left to reinvent dinner by using the remaining ingredients in a salad, frittata or burrito,” she added. “For less than $30, you can buy enough food for several meals including chicken breast, mushrooms, broccoli, pasta, lettuce, bread, eggs, tomato sauce and salad dressing,” Heller said. A family of four can spend that much easily for just one meal each for take-out and fast food. Planning the week’s meals ahead will make home cooking easier, faster, and cost-efficient. More importantly, research suggests that family meals enhance the health and well-being of children on many levels,” she said. It’s about personal responsibility, and our ability to set our own priorities and schedules. There is “health in the hearth”. Make your own food at home. We used to do this when we were healthy and these are the cultural habits that we need to remember to make dent in the chronic weight and health issues of our children. Show notes for the program RIGHT NOW (12/04/10, noon EST). How to keep your vitamins in your veggies — where they belong!! Boiling your veggies can lead to leaching of the water soluble vitamins (like the anti-carcinogenic properties of broccoli …) so you need to steam them. Water-soluble vitamins dissolve in water, reducing the amount of vitamins left in the vegetable. Vitamin C readily dissolves in water, as do the B vitamins. Cooking methods that use water may cause these vitamins to seep out of the vegetables, even without adding heat. WHAT? Saving your cooking water for use in gravies or juices can help reintroduce these water-soluble vitamins back into your foods and beverages. According to North Dakota State University, microwaving foods provides a method of cooking that helps to retain the vitamins in vegetables. Microwaving foods takes less time than conventional methods and reduces the need for water. Steaming vegetables until slightly tender may also help preserve both vitamins and color. Another quick method of cooking, stir-frying adds a crisp texture, without requiring long cooking times. However, one study found that microwaving drastically reduces the amount of antioxidants in broccoli. Flavonoids in broccoli were decreased by 97% after microwaving, compared to 66% after boiling and only 11% when the broccoli was steamed. On the other hand, another study found more flavonoids were retained in potatoes and tomatoes by microwaving than by boiling. The amount of nutrients lost into the water depends on how long the vegetables are boiled, as well as the surface-to-volume ratio. Cutting the vegetables into large pieces or cooking them whole will aid in retaining nutrients, while mincing them into small pieces before cooking will result in the greatest nutrient loss. While eating vegetables raw or lightly cooked may help them retain healthy amounts of vitamins, cooking can provide other benefits. According to the arthritis foundation, cooked tomatoes supply three to four times more lycopene than raw tomatoes. Cooking releases this antioxidant from the fibrous portions of the vegetables, making it easier to absorb. Cooking can also help destroy bacteria and parasites. 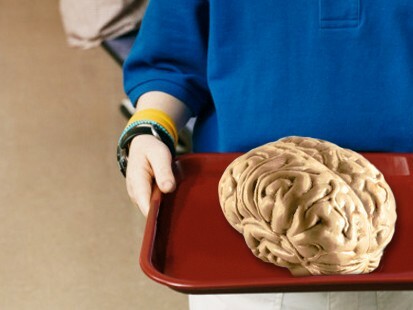 Will Clower Program Tomorrow: Build better brains, cook healthier foods. Saturday at noon (EST) I’ll be talking about how to increase your BRAIN function, and how to cook foods so you don’t leach out the healthy nutrients. Plus, the health news of the week. We’re on radio, internet radio, and VIDEO!! Interact with me during the show. Mark Bittman is awesome. This article from the NYTimes today carries 101 of his quick recipes for Grilling. I have Mr. Bittman’s “How To Cook Everything” cookbook. I find the recipes easy, sane (with no whacko ingredients that you buy and use for that one specific recipe), and tasty too — bonus!! If you’re not a griller, now is a good time to start. It’s beautiful outside, it’s easy to do, and now you have some easy recipes to flirt with!! If you are a griller, like me, there are so many variations and new ideas in here for you to try. Bon Appetit!! The simplest things are the best, and healthiest. If you’re looking for optimal health, choose pedestrian, common, everyday foods. Like polenta. I got this recipe from “An Embarrassment of Mangoes”, an awesome book about a couple from Toronto who take two years to sail down to the Caribbean. This particular recipe is so good that we make it all the time. In an saucepan over medium heat, combine coconut milk, butter and salt. Bring to a gentle boil. Gradually stir in cornmeal. Lower heat and cook for about 5-10 minutes, stirring constantly with a wooden spoon to prevent sticking. Dice up some peppered salami, and kernel corn. Add to the polenta once all the corn meal is in. Keep in mind that you can always thin it out if it appears too thick — no worries there. Then just spoon it on to your plate, with the other Caribbean-inspired foods on your plate. It’s the perfect side dish of health! And we’ve been eating sweet potatoes since prehistoric times (there are “sweet potato relics” dating back 10,000 years, discovered in Peruvian caves), but only in the Americas. It took Christopher Columbus to bring them to back to Europe. 100 years later, sweet potatoes were put down in the southern United States, where they’re still a staple food in the traditional cuisine. Sweet potatoes are a whopping source of vitamin A and vitamin C. These two are great alone, but are even better in combination. Vitamin A and vitamin C are very powerful antioxidants that work in the body to eliminate the free radicals that damage your cells and are associated with the development of atherosclerosis, diabetic heart disease, and colon cancer. This is the most delicious health food on the planet. The anti-inflammatory properties of this orange tuber can help reduce the severity of conditions where inflammation plays a role, like asthma, osteoarthritis, and rheumatoid arthritis. On top of the anti-inflammation properties, sweet potatoes also have lots of vitamin B6 to help reduce homocysteine levels. Homocysteine? The more of this you have, they greater your likelihood of heart attack and stroke. On top of the anti-inflammation properties, sweet potatoes also have lots of vitamin B6 to help reduce homocysteine levels. The more of this you have, they greater your likelihood of heart attack and stroke. 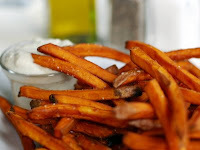 So, bake them, grill them, or put some in a pan and make sweet potato fries with them. It’s THE tastiest way to optimal health!